Tuesday through Friday, 10 a.m. - 4 p.m. Experience life as it was before the Civil War. Join interpreters dressed in period attire as they carry out the daily activities of a Roanoke Island farm in the 1850s. Stroll along the pasture fences and visit with the farm animals, listen to the ringing of the blacksmith’s hammer, help a farmer hoe his corn or carry water to the garden. In the cookhouse, hear the sizzle of salted ham in the skillet or help the cook make corn cakes. See laundry washed in a steaming iron pot over a hardwood fire and lend a hand if you like, or just relax under the shade of a tall pecan tree and watch coastal history come to life before your eyes. Hands-On Activities and Demonstrations May Include: Woodworking, cooking, ox-drawn wagon rides, children’s 19th century toys and games, farm and garden planting, harvesting and tending, blacksmithing, folk medicine, musket firing, self-guided tours of the c. 1847 farm house. Activities vary daily and by season and are weather-dependent. Island Farm also has several special events throughout the year. Sheep Shearing Day, Home School History Day, Evening Lantern Tours: Draped in Black, Pumpkin Patch and Garden to Hearth: Heritage Cooking and Food. Please refer to the above Entertainment/Events tab or our website for more information on these events. 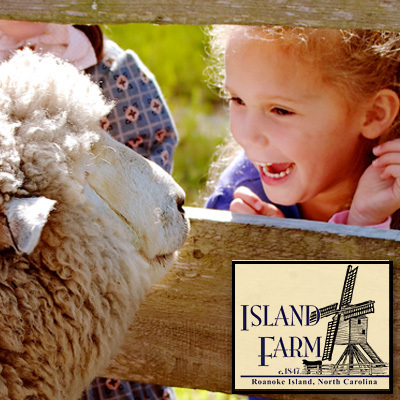 Island Farm is located at 1140 N US Highway 64, 2 miles north of Manteo. Only 15 minutes from Nags Head and 1 hour from Corolla, and just 5 minutes from the North Carolina Aquarium, The Elizabethan Gardens, Fort Raleigh, Roanoke Island Festival Park and the Manteo Waterfront.